The coeliac plexus is a bundle of nerves in your upper back. These nerves are a certain type, called sympathetic nerves, which control things like digestion, blood pressure and heart rate without you having to think about them. Nerves in the coeliac plexus go between the brain and organs like the pancreas, stomach, liver and kidneys. In certain conditions, like pancreatic cancer, this group of nerves begins sending signals that cause you to feel pain in your upper abdomen. By injecting the area around the coeliac plexus with local anaesthetic, or sometimes other medicines (such as anti-inflammatory steroids), it may be possible to reduce (or block) this pain for some time. The pain involves the sympathetic nerves which control the things that we do not need to think about, such as digestion, blood pressure and heart rate. This group of nerves do not normally send pain messages, but they become ‘switched-on’ in certain conditions. It is not known exactly why this happens. The doctor will examine you and then inject the area with a local anaesthetic before inserting one or two needles into your upper back. Once the doctor has found the correct area, the medications to block the pain will be injected. The injection may initially cause some discomfort, but this will soon stop. You will be able to go home a few hours after the procedure. You will be asked to attend the endoscopy unit having fasted for 6 hours beforehand. Under sedation an endoscope will be passed into the upper stomach. medications to block the pain will be injected through the endoscope into the coeliac plexus. You should be able to go home a few hours after the procedure. 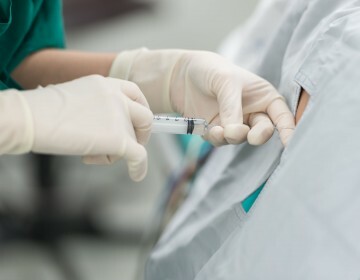 The anaesthetic should have very little effect elsewhere in the body but sometimes patients have loose bowel movements for a few days afterwards. Occasionally the drug given to you to block the pain can cause your blood pressure to fall. However you will be monitored by your medical team and, if needed, they can give you something to reverse these effects. Other very rare side effects will be discussed with you by your doctors before the procedure. You should not have this procedure if you are taking any medicine that thins your blood, such as aspirin, clopidogrel and/or warfarin. If you are taking any of these medicines, please tell your doctors as soon as possible so they can be stopped for a while. If successful, pain relief can last three months or longer. Your pain should be reduced, so you should be able to move around more easily. If successful, the block can avoid the need to take pain killers, or at least reduce the number of tablets you need to take. Your length of stay after this procedure (which is usually short) will be discussed by your doctor.